In today’s internet-based economy, achieving and maintaining brand exclusivity is critical to driving customer traffic to your business. A recent analysis of consumer products sold through e-commerce sites shows 75% of their web traffic comes from branded search queries. This figure is staggering and demonstrates the pivotal role in trademarks that play into driving and sustaining revenue growth. Trademark registration provides nationwide priority based on the filing date of the application. This is true even if your use is limited to a small region of the US. Nationwide priority protects future expansion and a national web presence. Your registration will bar registration of later filed applications for similar trademarks. This is important because the Trademark Office limits its searches to prior filed applications and registrations and does not consider unregistered marks in determining whether an application should be registered. Trademark registration provides a statutory presumption that (a) the mark is valid, (b) you are the owner of the mark, and (c) you have the exclusive right to use the registered mark. Instead of having the initial burden to prove these essential elements of a claim, the court will presume that you have met these requirements and shift the initial burden to the infringer. The registration serves as constructive notice of a claim of ownership. This eliminates any justification or defense of good faith adoption and use made by a third party after the registration date. Registration grants the right to use the registered trademark symbol ®. Use of the ® communicates to your competitors, customers, and consuming public that your trademark is exclusive and protected through federal registration and that you mean business. Registration grants the right to file a trademark infringement lawsuit in federal court and to obtain monetary remedies, including infringer’s profits, damages, costs, and, in some cases, treble damages and attorneys’ fees. The registration may serve as the basis for an international trademark application or provide a basis for priority in a country outside the US. After five years, the registration may become incontestable, creating conclusive evidence of the registrant’s exclusive right to use the mark. Trademark registration provides a basis to register the brand with Amazon and other e-commerce sites that will use your registration to prevent the sale of counterfeit goods. 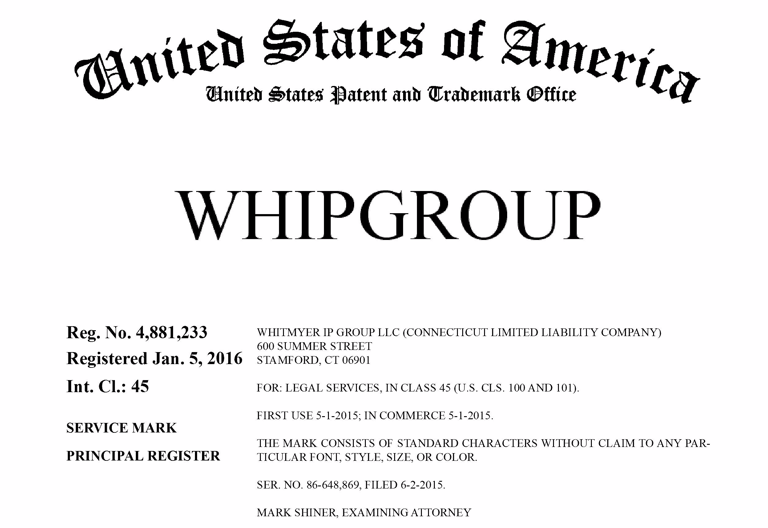 WHIPgroup attorneys regularly counsel brand owners on the most effective and efficient means to protect their trademarks. If you are interested in registering your trademarks or have any questions regarding your existing portfolio, please contact us. We can provide a courtesy consultation and estimate.